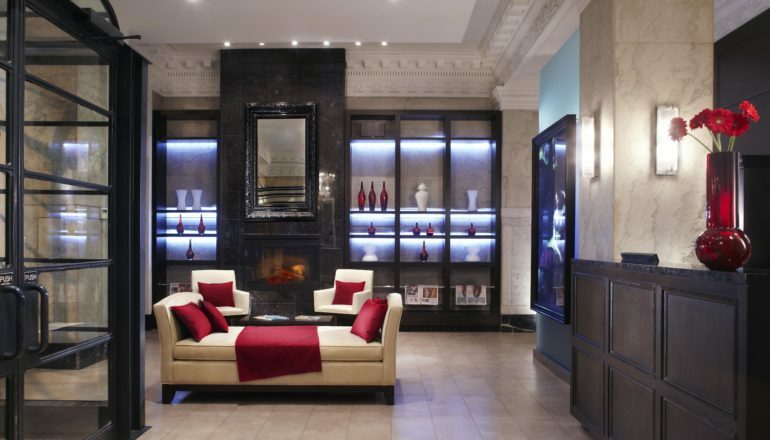 Hotel Victoria: A Historic Boutique-Style Hotel in Downtown Toronto. With our iconic history, sophisticated accommodations, and central location, the Hotel Victoria has delighted visitors in downtown Toronto for over 100 years. The Hotel was prosperous for many years and even served as an emergency hospital during the flu pandemic when the hospitals were overflowing with sick patients. After facing the hard times of the Great Depression and prohibition, the Hotel Mossop closed in 1917. This architectural gem was quickly snapped up by the Elliot Brothers, who refurbished and renovated the entire building. It was then renamed, and remains, the ‘Hotel Victoria’ to pay tribute to Queen Victoria. Hotel Victoria is conveniently located in Toronto’s Financial District, on Yonge Street. To the east of Hotel Victoria, guests can easily explore the St. Lawrence Market District and old Toronto. To the West of Hotel Victoria, you can find the energetic Bay Street crowd and top entertainment destinations. Local attractions, shopping, dining, history, architecture and more can be found within walking distance of Hotel Victoria. The soaring office towers and condominiums in our downtown Toronto neighborhood make us stand out, representing a simpler time in Toronto’s rich history. Experience the old world charm of our historic building with its fascinating past, while enjoying the modern comforts and convenience of our boutique hotel.